Time elapsed images of the LBM simulations. Credit: Ebrahim et al. Spray cooling is one of the most promising methods for cooling high heat flow electronics. Two-phase spray cooling, in particular, has been shown to cool heat fluxes that are orders of magnitude higher than traditional cooling methods like fans and heat sinks. The complex physics of two-phase spray cooling, in which droplets are atomized with a secondary pressurized gas phase, demands deeper understanding. 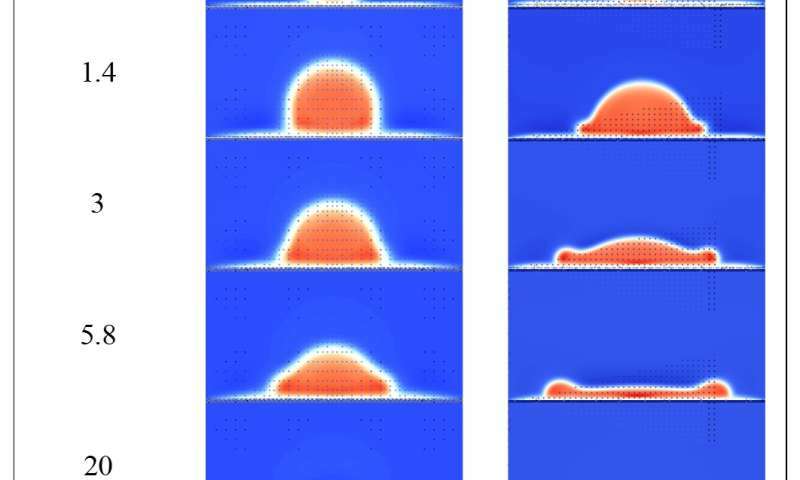 To tackle this, researchers from the United States and the United Kingdom investigated the basic physics of droplet impingement both experimentally and computationally. They used a computational approach called the lattice-Botzmann method (LBM) to simulate the impact of a single microdroplet on a dry surface. Their findings, reported this week in the journal Physics of Fluids, could benefit many other applications in addition to spray-cooling, including inkjet printing, paint coating, plasma spraying and microfabrication. For practical reasons, most research so far has been based on studying millimeter-size droplets and the hydrodynamic impacts on dry solid surfaces. However, droplet sizes in spray cooling are three orders of magnitude smaller, which means that the physics of liquid dispersion and the dynamics of the impact could be vastly different. To find out, the researchers turned to LBM algorithms, which are used for the computational modeling of fluid flow in complex geometries and multiphase flows. It also incorporates a mesoscopic approach that covers the gap between the microscopic molecular dynamics and the macroscopic fluid mechanics. "As a result of the LBM, we were able to distinguish the appropriate scales of the problem and therefore successfully normalize the dynamics of the spreading phase, which has complicated physics at the microscopic level," said Mahsa Ebrahim, postdoctoral fellow at the University of Villanova in Pennsylvania and a co-author of the paper. "In the literature, there are many correlations and analytical models for high-impact droplet dynamics. However, most of them failed in the lower impact regimes because of the distinct physics at the microscopic level." For single-phase spray cooling, a liquid is sprayed in ambient air without significant air pressure or forces acting on the droplet surface. The researchers were able to develop a correlation for the system that can reasonably predict the instantaneous droplet diameter after the low-impact regimes. In two-phase spray cooling, the atomizing gas forms smaller droplets, which impact the surface under an atomizing gas flow, called a stagnation jet. It had previously been hypothesized that the jet would affect the spreading in all impact conditions. However, through LBM, the research team showed that there are no significant effects for certain cases, which gave way to an entirely new way to characterize such systems. The jet had no such effects for capillary number ratios below 0.35, and thus defined a new dimensionless metric (Ca*) as the ratio of jet-to-droplet capillary numbers. "Based on the droplet and jet capillary numbers as a metric to measure whether the normal and shear forces of [the] stagnation jet will affect the droplet spreading phase," Ebrahim said, "we found that the droplet spreading dynamics will be influenced by the stagnation jet only for capillary numbers greater than 0.35." From this, the researchers determined that the physics for microdroplets differ from their macro counterparts, a vital distinction to understand, as atomized droplet sprays find ever more applications.